Alright ladies, I don't know about you, but I hate sloppy nails... and I rarely have time or the childcare to get manicures. Seriously. Every nails salon near us closes at six. What is that!? In an effort to counteract snaggle nail I have stepped up my at-home manicure skills. 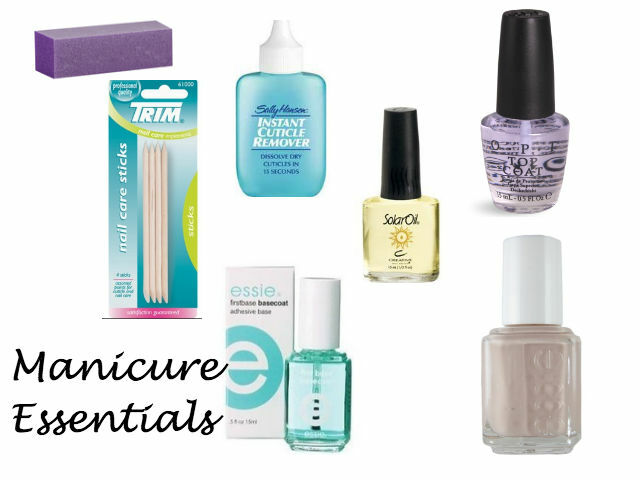 Below are what I have found to be tried and true essentials to a good DIY manicure! This Essie polish is one of my favorite shades. It's a (shocker) perfect neutral. I also tend to avoid any quick dry sprays, drops, or polishes because they seem to soften the polish and work the opposite of how they should for me. I always end with a coat of Solar Oil on my cuticles after letting my nails dry for a few minutes. On that note, I am off to paint my nails!